These are quick and easy to make. They remind me of pizza burgers, only way, way better. And much better for you too. Slice tempeh patty into four smaller patties. I slice it thin and then slice each thin slice in half. Heat tempeh in pan with marinara sauce, simmer until warm, add vegan cheese and toppings, cover pan with lid so cheese melts. Toast bread. 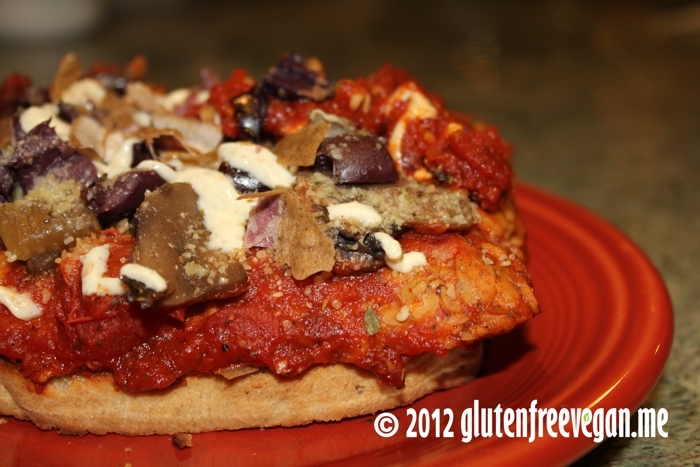 Place the tempeh pizza patties on the bread. Eat. This entry was posted in main dishes, Meals in Minutes, Recipes and tagged Daiya, gluten-free, gluten-free bread, glutenfreevegan.me, glutenfreeveganme.com, healthy, Italian, italian recipes, Kalamata olives, marinara, mushrooms, onions, quick vegan meals, recipe, Tempeh, vegan cooking, vegan recipes. Bookmark the permalink.